My image assignment is here. I enjoyed working on each of the tasks (well, maybe not the gradient) and believe that I have a decent grasp on the skills necessary to reproduce the work in the future. I particularly enjoyed colorizing and find myself gazing with longing at old photographs; this is much more fun than a coloring book and pencils. 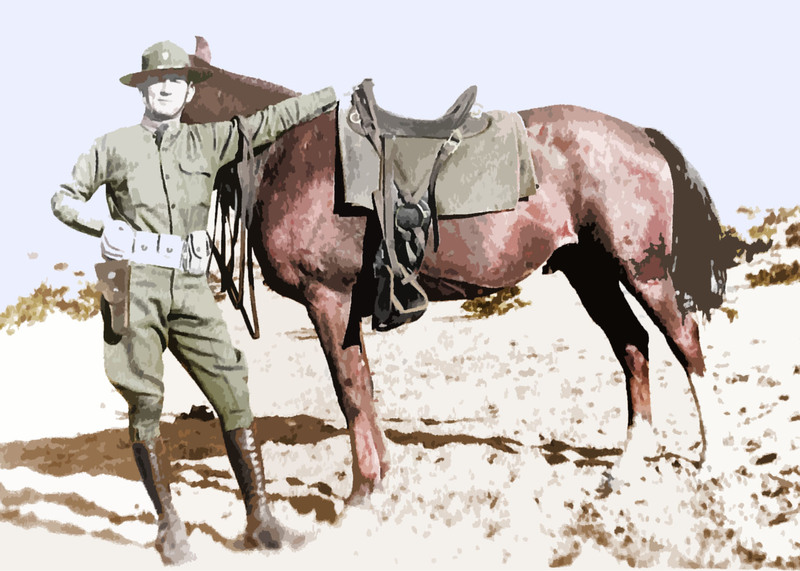 As I worked on my young cavalryman and his horse, I ruminated on the class discussions and blog commentary about the ethics of colorization. I remember when TMC started colorizing films, and the ruckus it created over such issues as the original artistic vision, the quality of the colorization itself, and misleading viewers. I also recall seeing a documentary about the craft of black and white filmmaking, which required creating effects to replace the role that color played — as a result, I often spend some time looking at the lighting and stage design in black and white films. Today, I don’t think anyone even notices when a colorized film is presented — but I also see that the original black and whites are still being shown often. I expect that the expense of colorization prevents wholesale transformation. I don’t think my colorization is going to fool anyone, but I’m fairly pleased with it except for the ground. I started wondering if a bit of over-emphasis might help to signal restoration work to the viewer without detracting from the intended use — such as a book cover, magazine article, or gift shop artwork. You can click on the images to enlarge them. What do you think? Posterized version. This filter flattens continuous color into fewer tones and regions. Cutout Filter. Creates the effect of a painting. I commented this week on Kater’s, Mark’s, and Rebecca’s blogs.